The Ceiba speciosa (A. St.-Hil.) Ravenna (1998) is native to Argentina, Brazil, Paraguay and Peru, where it grows in the savannas and in the deciduous forests in markedly seasonal climates. The name of the genus comes from the name utilized by the natives of the Caribbean for some plants of the genus (in particular, the Ceiba pentandra). The name of the species comes from the Latin word “speciosa” = splendid, magnificent. 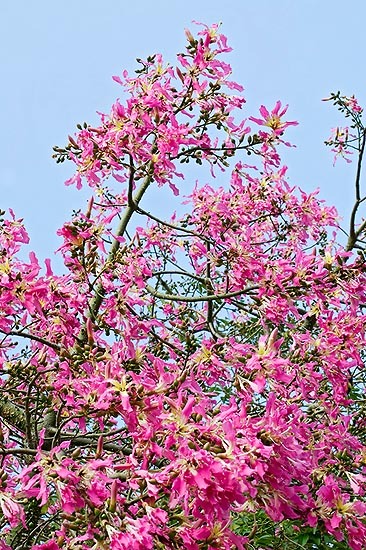 Common names: “Brazilian kapok tree”, “floss silk tree”, “silk cotton tree”, “South American kapok tree” (English); “arbre bouteille”, “chorisia rose”, “kapockier” (French); “albero bottiglia”, “chorisia”, “falso kapok” (Italian); “arvore-de paina”, “barriguda”, “paineira”, “paineira-rosa” (Portuguese); “arbol de la lana”, “bitaca”, “flor de mayo”, “palo borracho”, “palo borracho rosado”, “palo rosado” (Spanish); “Brasilianischer Forettseidenbaum”, “Florettseidenbaum”, “Wollbaum” (German). Deciduous leaf tree, tall up to about 30 m, with swollen trunk in the lower part, with a diameter of 1-2 m, with tender and porous wood, and green bark in the young specimens, green-grey in the adult ones, covered by very curious conical thorns. The leaves of the Ceiba speciosa are palmate-compound with 5-7 elliptic, 6-10 cm long and about 4 cm broad leaflets, with sharp apex and indented margins, of a glossy green colour on the upper part, green-grey under, on an about 8 cm long petiole. The flowers, solitary or assembled in groups of two or three units at the axil of the terminal leaves, are hermaphrodite, waxy, of about 15 cm of diameter. Very showy, the flowers have five oblong petals with undulated margins with a pink or reddish colour in the terminal part, white or yellowish, with dark purple dots or striae internally, and with, at the centre, a showy staminal tube, long about 5 cm. The fruits are dehiscent (fruits which open spontaneously when ripe, along the minor resistance lines, freeing the seeds). They are oblong capsules of 10-15 cm of length, containing several black globose seeds of 5-6 mm of diameter, dipped in a white woolly mass. It easily reproduces by seed, which germinates in about one week, on a sandy substratum. Plant of great landscape value, due to its imposing bottle-shaped, thorny, greenish, trunk and to its showy, abundant blossoming, which happens at the same time of the fall of the leaves. Suitable to tropical, subtropical and warm temperate climates, as it resists, when adult, to temperatures as low as -4/-6°C for a short time, in case with danger to the youngest branches. 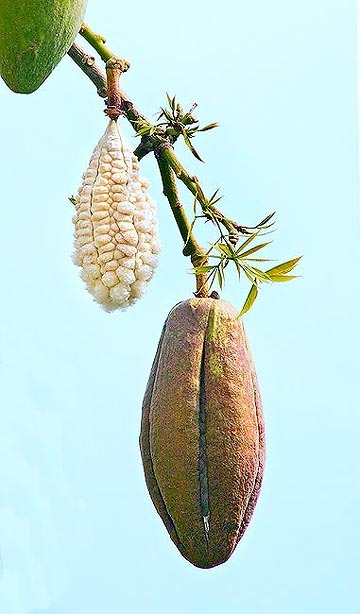 The Ceiba speciosa is a plant to be placed in full sun, on well draining soil, keeping in mind that its rooting apparatus is particularly aggressive and rather superficial, therefore it is to be placed well far away from walls, enclosures, sidewalks, sewers, etc. Fast growing, it can bear long drought periods as it stores water during the rainy season, in its spongy trunk. Where they can represent a danger, the spines can be rather easily taken off up to a man’s height, even if this, of course, compromises one of its peculiar characteristics. In pot, thanks to the particular shape of its trunk and the superficial roots, it is a subject appreciated by the collectors of caudiciforms and for realizing spectacular bonsais. The silky fibres which wrap the seeds are utilized for stuffing in lieu of the “kapok” (the fibres obtained from the fruits of the Ceiba pentandra), and as thermal insulator. Parts of the plant, in particular the spines, are variously utilized in the popular medicine.